Mary Isobel Catherine Bernadette O’Brien was born in West Hampstead in north London, in 1939. Along with her oldest brother, Dion, she recorded her first tape of a song they sang while still children. Her dad was an unhappy accountant who dreamed of becoming a concert pianist, but never became one. While Mary’s mother, according to the Karen Bartlett autobiography, Dusty: An Intimate Portrait, “was continuously drunk and sat all day in cinemas.”As she grew up, Mary went to school at a Roman Catholic Convent. At the age of 18 she became a member of a female group named the Lana Sisters. The group sang backup to pop singer Al Saxton who had several Top 30 hits in the late 50’s in the UK, including a cover of Sam Cooke’s “Only Sixteen” and “You’re The Top Cha.” While Saxton enjoyed his moments of fame, Mary teamed up with her brother, Dion, and a friend of theirs named Tim Field. By the end of 1959 she had taken the stage name of Dusty Springfield. The trio, now known as The Springfields, got a record deal with Philips Records in 1961. 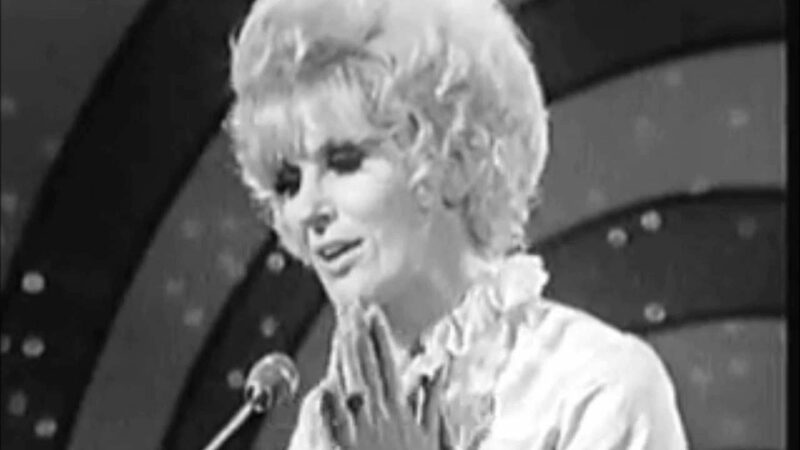 Dusty Springfield had a series of hit records including the Burt Bacharach tune, “Wishin’ and Hopin’” in 1964, her follow-up to “Stay Awhile.” In January, 1965, Dusty in San Remo, Italy, was an entrant in Italian Song Festival where she reached the semi-final. At the festival she heard Pino Donaggio perform a song titled “Io Che Non Vivo (Senza Te).” Its English version, “You Don’t Have to Say You Love Me” was sung by American country singer, Jody Miller. Dusty fell in love with the song and recorded it. Her version became a #1 hit in the UK in the spring of 1966 and on the June 19, 1966, the top of the CKLG pop chart in Vancouver. She continued to make the Top Ten in 1966 with “Goin’ Back” and “All I See Is You”. “All I See Is You” is a song sung about a relationship after the breakup. And it is sung from the perspective of someone who is certain “I won’t live again unless it’s with you.” The singer is consumed with thoughts of their ex-partner. Though they try not to think about the times they shared, the ex-partner shows up in every dream and “no matter where I am or what I do all I see is you.” Clearly, it is hard to put the past behind when every waking minute and dreams at night are filled with thoughts and pictures of the love they once knew. In a Psychology Today article Dr. Berit “Brit” Brogaard writes that being obsessed with an ex-partner “can derail your life.” She recommends practicing shifting your attention away from your ex and their social media, phone and other devices. Take time to focus on something else for at least ten minutes. Instead of obsessing about your ex and stalking them on the web, Dr. Brogaard suggests this helpful journal writing exercise to focus on your own inner landscape. “… when you are obsessing and feeling the urge to engage in your compulsive behavior, write down your thoughts—exactly as they are. If your thoughts are repetitive, write the repetitive thoughts down, even if you need to write the same thing 20 times. Writing the same thing over and over can actually help make your thoughts less intrusive. Don’t send what you wrote to anyone—and do it with pen and paper, not onscreen, so you’ll be less tempted to send what you wrote to your ex.” She finally advises you schedule an “obsession session” for half an hour each day. This way, unlike the person in the song “All I See Is You”, you will have a time-limited appointment to stick to where you can attend to all the compulsive thoughts about your ex. If you have any obsessive thoughts percolating ahead of your “obsession session,” tell yourself to file that for your appointment later that day. Dusty Springfield was a booster of American R&B music and her covers of soul singers across the Atlantic introduced the record buyers in the British Isles to people like Aretha Franklin and Gladys Knight. On one of her singles she was backed by Doris Troy of “Just One Look” fame. A forerunner of the Northern Soul genre, Dusty Springfield’s covers of soul music was an ear-catching fusion and record-buyers rewarded her with her album, Dusty in Memphis, and others. After that her album, The Look of Love, the title track was featured in the 1967 spoof film of James Bond titled Casino Royale. The film starred David Niven, Peter Sellers, Ursula Andress, Orson Welles and Woody Allen. A second single from the album was “What’s it Gonna Be”. During her career she had four Top Ten hits on the Billboard Hot 100 and eleven Top Ten hist on the UK Singles Chart between 1963 and 1987. Her last Top Ten hit was a collaboration with The Pet Shop Boys titled “What Have I Done To Deserve This?” In 1994 the crime fiction movie, Pulp Fiction, included “Son of a Preacher Man” in the soundtrack. 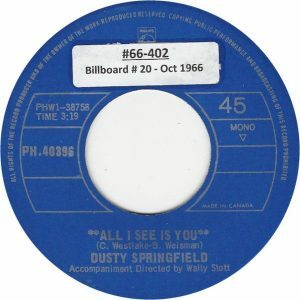 As the film was a box office smash, it led to a revival in popular interest in Dusty Springfield’s albums and hit records. Her personal life was challenged by living in a pre-Gay liberation era. Her exploration of lesbian relationships made her one newspaper headline away from having her career disintegrate. She had relationships with numbers of women including fellow recording artists Norma Tanega (1966-73) and Carole Pope (1981). Springfield also had addictions to alcohol and drugs and was sent to a psychiatric ward on at least one occasion. Referred to as a “bachelor woman” by some in the press, Dusty Springfield told the press in 1970 she didn’t care about who slept with who, “people are people” she said. Dusty Springfield died in 1999 after several years suffering with breast cancer. She was 59 years of age. Stephen Holden, Dusty Springfield, 59, Pop Star of the 60’s, Dies, The New York Times, March 4, 1999. Rachel Hosie, Why You Get Turned Off When Someone Shows Too Much Interest, The Independent, London, UK, September 21, 2017. Miranda Athanasiou, 5 Reasons He’s Starting To Pull Away From Your ‘Almost’ Relationship, Elite Daily.com, June 27, 2016. C-FUNTASTIC FIFTY, C-FUN 1410 AM, Vancouver, October 22, 1966. Berit “Brit” Brogaard, “How to Stop Thinking About an Ex,” Psychology Today.com, October 21, 2016.